The TGM is available with tonnages between 13 and 26 t while the engine outputs range from 240 to 326 HP. The truck was design to deal with tasks in local or long-distance traffic as well as on the building site. The TGM shares a lot of elements with the TGL model, but has a more purposeful character and is equipped with stronger engines. The TGM is available in four cab configurations including C, L, LX and Crew cab versions. There is no tractor version available and the truck comes only in rigid and tipper shapes with 4x2, 4x4.6x2 and 6x4 axles. The overall exterior design keeps the same lines of the TGM model. The front rectangular grille bares the big MAN logo embossed in the center and the chromed strip placed on top. The main differences are the bigger bumper, the high ground clearance and the imposing wheels which underline the rugged character of the truck. Inside, the cabin is identical with the one from the TGM. The materials are pretty solid and look lasting, but the overall design looks dated. However, you won’t have any complains about the ergonomy as the controls come easy into hand and have a logical position. The dashboard is undoubtedly the most uncluttered in the business while the instrument cluster is also easy to read and features big and clear gauges. The truck features big all-around glass areas that offer superb forward and sideways visibility which is essential in this segment. The driving position is also good and thanks to the standard multi-way adjustable seats it will be easy to make yourself comfortable. The TGM comes with a wide range of seats including the standard static seat, the comfort air suspended seat and the luxury seat with lumbar support and heating function. 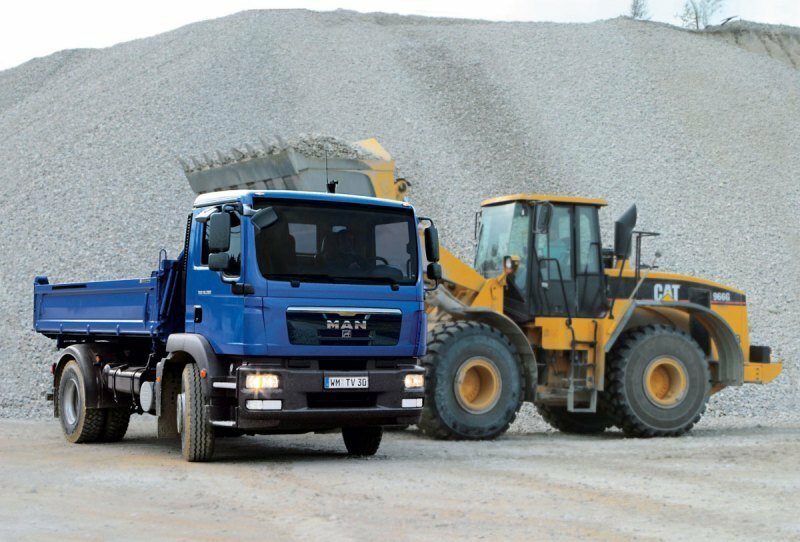 MAN has fitted its trucks with the same ergonomic steering wheel and this is not a bad thing as we love its configurations as it offers a good grab. The TGM can be fitted with an optional multifunctional steering wheel which gives permits you to the central digital information display, phone and radio. With a simple press of the foot-operated button in the footwell the steering wheel can be adjusted for height and angle. It can also be released and swung up in a single easy movement for convenient access to the cab. The truck is also available with an optional air-conditioning with automatic temperature control. The bunk beds in the L and LX cabs feature a 5-zone slatted frame and offer an adequate comfort. 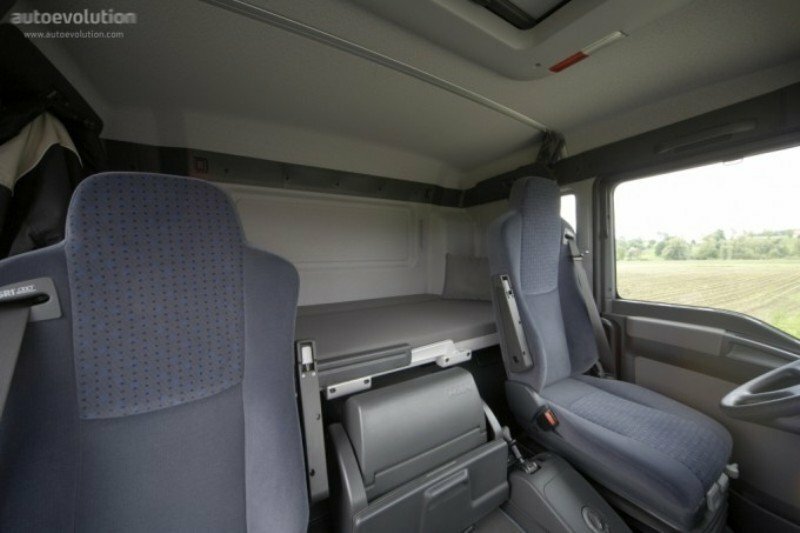 The optional multifunctional stowage compartment in the L and LX cab allows the co-driver to stretch out and rest while the truck is parked up. When is half extended, it offers practical stowage space with approximately 200 litres capacity. Moreover, there are plenty of storage places available all-around the cabin and we don’t have any complains in this department either. We like the generous storage compartments located above the windscreen and also the bins and pockets in the door panels. In the centre of the dashboard there are cup holders and several compartments for small items. There is also place for larger objects which can go into the centre-tunnel console and the storage compartment on the rear wall of the cab. The MAN TGM is equipped with either 4 or 5 cylinder engines which respect the Euro 5 emissions norms. The 4 cylinder range develops between 150 hp - 250 hp while the 6-cylinder engines have maximum outputs between 250 hp - 340 hp. The engines are equipped with a two-stage turbocharging which offers a great pulling power right across the rpm range. The engines can be mated on an optional automated TipMatic gearbox with EasyStart. The transmission is at par with its rivals and offers smooth shifts with perfectly choose momentum. It also needs only minimal manual interventions which can be made using a toggle lever mounted on the steering wheel. Moreover, the truck is also equipped with a kick-down function which is used when the engine brake is engaged and selects the best gear for maximum engine braking. The TipMatic is available with six-speeds for the 4-cylinder engines and with twelve-speeds for the 6-cylinder engines. There are also manual gearboxes available with five, six or nine speeds. The TGM 4x4 was designed for the tough conditions which require better traction. This model copes well with the building sites, snow-clearing applications and off-road missions. Driver-engaged all-wheel drive is standard but there is also available a permanent all-wheel drive with pneumatically engaged inter-axle differential lock. The all wheel drive system features an optional electronic transfer case and differential management which supports the driver on the road and off, helping him to operate the vehicle according to the traction required. The all wheel drive MAN TGM models also feature planetary-hub axles for more ground clearance and pneumatic hill holding brake. The 4x4 chassis are available as 13-tonners with combined leaf and air suspension and as 18-tonners with all-leaf suspension with either single or twin tyres. The MAN‘s air suspension, maintains the vehicle at a constant ride height, regardless of load. For road-going models, the lifting/lowering ranges of the rear axle are 180 mm/90 mm. 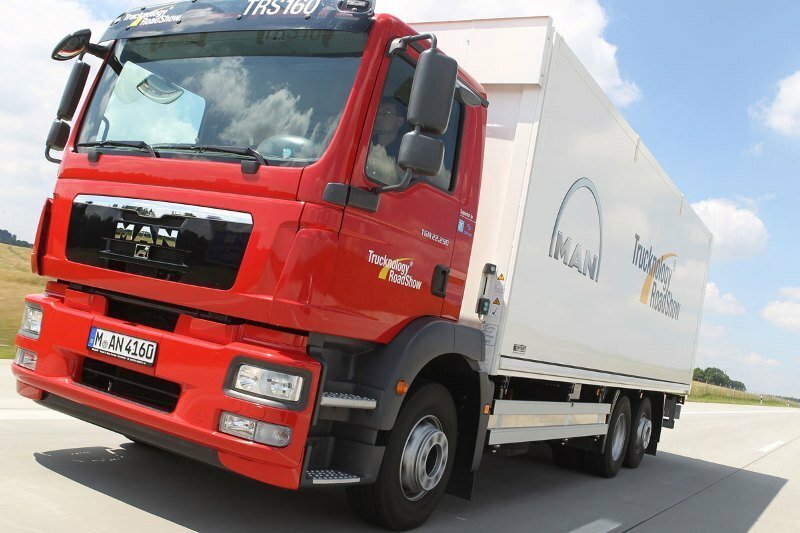 The MAN TGM is available in different wheelbase versions which range from 3,050 to 6,975mm. Around the city the truck copes well with the traffic thanks to its engaging steering, which is light and gives you a good feedback from the road. On the highway the TGM is very quiet and thanks to the good soundproof the engine noise it’s not intrusive. The TGM is an extreme off-roader which performs brilliantly well. 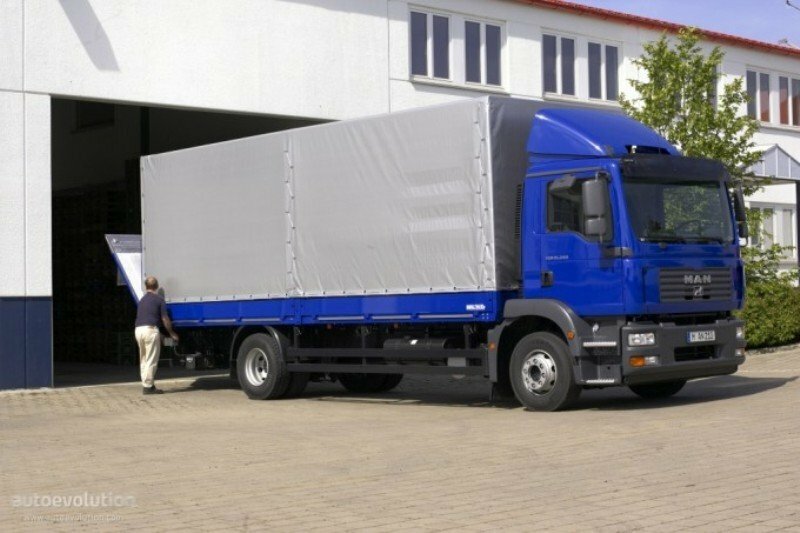 You can also rely with confidence on the MAN build quality as the truck is a strong piece of German engineering. There is a wide range of engines and chassis available so it will be easy to find the perfect truck for your needs. The faultless transmissions are also among the best in the business and the cabin ergonomy is top notch. You won’t complain about the all wheel drive system wither as its pretty capable and can get you out of the toughest terrains without too much drama.